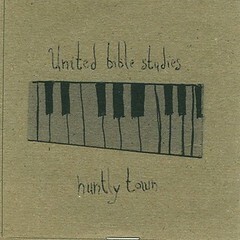 Recorded in one day in Providence, Rhode Island on their 2008 US tour, I Am Providence is utterly unique even in the discography of United Bible Studies. The band performed a musicial ritual at HP Lovecraft's graveside then an a capella house show that evening with locals Alec K Redfearn, Orion Rigel Dommisse and Manbeard and their touring companion Sharron Kraus. “Babbleon Cork” is the result of my residency in the Guesthouse in May 2010. I’ve created an audio collage in three parts composed solely of sounds recorded during my time in Cork.....The result is a short album which captures the energy of the city mixing layers of abstracted sounds and the fluent, irreverent utterances of the Corkonians themselves. I’ve released this project as a free download under a creative commons licence leaving it open for sampling and remixing." - Gavin Prior, November 2012. "Once again too inscrutable for a title. Recorded in early 2004, this marks the move towards increasingly alien, electronic territory. This is the most harsh and austere Murmansk release yet." A single 28-minute track of subtle nocturnal ambience from the French sound artist Sebastien Chou. Close attention is required to perceive its ever-evolving nature. 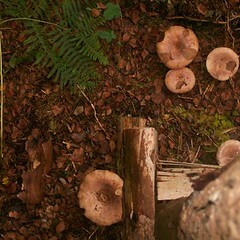 There's also a blog with beautiful photogrpahs to accompany the series. Friday, 25 May 2012 More information here. Darugaries was formed in Osaka, Japan in 2002. 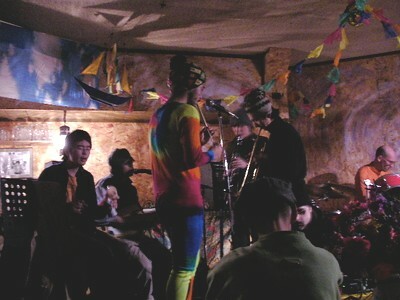 They play a kind of traditional, psychedelic meditation music in an idle performance. Their music is founded on bass guitar around which voices, wind instruments and electronics weave. We can also hear electronics and percussion played on whatever found objects come to hand. Members and musical instruments come and go as time passes. On this tour the band is playing bass, trumpet, clarinet, trombone and electronics. Saturday, 21 January 2012 We're continuing to re-release the UBS back catalogue. Black Colcannon is free and Huntly Town is a paltry 3 Euro which will help pay for all those other free downloads we're doing. Saturday, 21 January 2012 Following on from the Debut release on Fort Evil Fruit Mr Colohan has put together an EP of recordings which weren't recorded with a release in mind. Saturday, 21 January 2012 Fort Evil Fruit is a new Irish-based cassette label dealing in psych, metal, whatever. David Colohan has operated under the name Agitated Radio Pilot since 1993. The development of a new approach based on field-recordings, shapenote singing, loops and synths, and coloured by an interest in Hasidic mysticism, prompted the winding up of that project and the adoption of a new identity: Raising Holy Sparks. The debut release ‘Beyond the Unnamed Bay’ features a pair of side-long suites made up of songs and instrumentals. 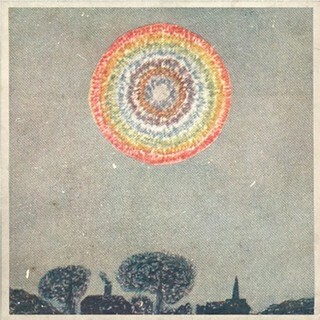 The well-crafted balladry of Here Begins Our Lasting Joy will be familiar to fans of ARP’s World Winding Down album, while the lengthy The Depths of Bailey Point follows on from the abstract and atmospheric works found on The Lunar Arcane and The Days and Hills Grown Old. However the synth-pop stylings of As Far As We Can Go presents Colohan’s songwriting in an unexpected new context. The album draws together the strands of Colohan’s earlier music into a more cohesive whole and a richer sonic palette, aided by Vicky Langan (Wölflinge, United Bible Studies) and Declan Q Kelly, with guest appearances including Stefan Neville (Pumice), Richard Moult and Audrey Ryan. The cassette includes a download code, and the cover art features the RHS logo designed by Oscar Strik. 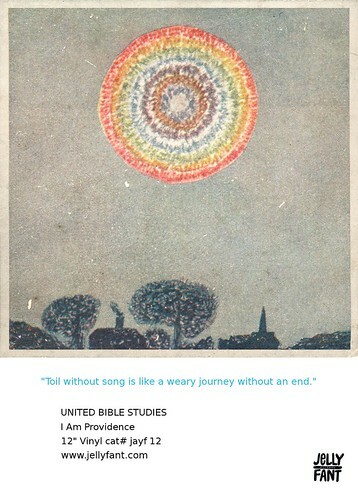 Having been asked to play at the seventh Terrastock Festival in Louisville, Kentucky, United Bible Studies embarked on a three-week tour of the USA alongside Oxford-based folk singer Sharron Kraus. This cassette is compiled from recordings of those 2008 shows. This is arguably the most comprehensive UBS release to date, representing both the psychedelic, improvisatory side of the band as well as their roots in traditional song, along with some surprises, such as an ethereal version of John Dowland's Flow My Tears. 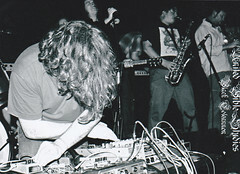 It's also unique due to the prominent presence of the aforementioned Kraus, and marks the first UBS appearances from Michael Tanner (Plinth, Mark Fry) who has gone on to become a key member of the band. David Colohan, Richard Moult, Áine O'Dwyer, Gavin Prior, and Tuula Voutilainen complete the core lineup, and guests include Jesse Poe and members of Khouetek and Talbam. The album ends with sax colossus Paul Flaherty being coaxed onto a New Haven stage for a visceral 14-minute blowout. This eclectic, sprawling, ragged album works as a reflection of the tour in microcosm. It contains 16 tracks in 83 minutes, and includes a download code (including extra artwork). Cover art by Antimony Media.